Dominating SERPS is what all of us dream of. And, despite popular opinion, being on the 2nd page of a query’s results doesn’t mean that you’re not interested in publishing great content that solely serves the reader’s’ interest. Sometimes it means just that the industry is highly competitive and it’s almost humanly impossible to outsmart the competitors. What to do then? We thought of the most complete list of SEO techniques to help you walk this extra mile and finally see the results in rankings that you’ve always been waiting for. Not having a lucrative profile makes Wikipedia one of web’s most trusted sources when it comes to delivering impartial, objective information to its readers. Getting a link from it sparks the interest of anyone, since it’s authority is sky high. That is why promoting yourself through its means isn’t an easy job. There is, however, one way of associating yourself or your brand with Wiki – and that’s spotting opportunities of link building from broken sources on their articles. Finding the broken links isn’t hard to do, as they have a dedicated page for it. After finding the links that used to serve as sources for the Wikipedia articles that interest your professional area, it’s not enough to just write something sloppy hoping you’ll get to replace the initial source. The editors, who are dedicated to providing the most qualitative information there is, will do anything to make sure that the article you’ve written is at least as good as the previous one. Now the question remains, how can you see the content of a dead link/broken page? The Wayback Machine is the solution to your problem here. Inserting the URL of the former Wikipedia source, you’ll be able to browse through that link’s history and see what it once used to look like. Now you’ve got a sense of what the encyclopedia editors believe is a solid piece of content that’s worth being mentioned as a source to their articles – and this has got to count for something. All that remains for you to do is to actually replicate a dedicated page on your website on that specific topic and make sure that’s more thorough and useful to the reader. Then submit it and wait. While the answer rate isn’t quite 100%, it can get up to 50% and, if you’ve done the documentation right (and if your website doesn’t scream out ‘spam’) you have a good chance of being approved. The wording of your search query matters a great deal when it comes to the returned results. This is because, since Hummingbird (Google update algorithms), we know for sure the search engine is trying its best to contextualize semantic meaning in order to understand the intention behind the search query. Moreover, introducing conversational search, Google aims to provide answers that are to-the-point and accurate. However, the explanation for this phenomenon is as it follows: whenever I search for a term, the search engine will understand that there’s a need behind my search query and will try to answer to that instead of the textual wording. Partial synonyms work great as well. For instance, if I’m searching for the term ‘SEO consultant’, among the first results on the first page will be ‘SEO expert’, ‘SEO services’, ‘SEO company‘, as the meaning behind the wording doesn’t differ that much. And although we risk being a little redundant as to what a synonym is, in this case it doesn’t necessarily refer to the lexical identical meanings we were taught in school, but rather a contextual, broader meaning. Many times, the synonym will be an association that we make, a logical path that we follow in our thought processes, hence the differences in meaning from our screenshot above. Even the most popular and authoritative sources on the web have to constantly deal with the issue of broken links. While redirecting or repairing them is a solution when you’re the admin of the site, there are other perspectives of this issue as well. From a competitive point of view, if one of your competitors has broken links with a large number of link juice coming from many referring domains, there’s no reason why you wouldn’t turn this in your favor. After finding the number of broken links, you can export the links to see which one best suited the style of your own website. Of course, there are a few very tempting moments when you are willing to replicate the content of whichever page that used to have 100 k links and 5 k referring domains. However, the challenge is to create something even better, more in-depth, but equally relevant. After saving the broken pages that are most linked to, you can run a separate analysis with the Site Explorer to check the backlinks of each URL that you’re interested in. Our Site Explorer runs a quick backlink analysis, showing you a number of relevant stats on the page that interests you. One of its features is that allows you to have a clear picture of who linked to the specific content. This way, you can transform the badly managed situation of your competitor’s into an advantage. As it generally happens in digital marketing, content comes first. Make sure its quality is indisputably better than the former one. Then, you can contact the webpage’s owners to let them know they may be interested to replace a broken link with something of value that you’ve written. To have a better idea of what quality looks like for the owners of the pages linking to the content of your competitor, you can use the Wayback Machine to access the page as it used to be when it was live. After you’ve pictured a clear image of how the former content looked like, it’s time you started working on something even better – significantly better, to increase the chances of getting links from authority sources. Then, you can email them about the broken links and suggest your newly created piece of content to replace the initial one. While some of the admins will be reluctant at first and will believe you’re only in for the links, the better you document the article and the more information-rich it is, the bigger the chances to get a good link. Because Keyword Planner doesn’t always suggest the most innovative keywords, it’s always best to look over the fence and see how people in your industry promote their products and/or services. It’s clear that, while they’re paying for them, the keywords are very relevant for the targets, so all you have to do is get a fresh perspective on what seems to perform best on the SERPs. If you remember the semantic associations and the synonym using discussion earlier, the reason why these long tail keywords seem to work although they’re not necessarily very to the point is that people often search for solutions. It’s enough to identify the concept behind a search query to associate with anything semantically related to it. And, if you’re out of ideas, the AdWords campaigns are always there to give you a hand. All you have to do now is incorporate these newly found long tail keywords in your further blog posts on your website. Needless to say, this SEO tip is only complementary, so it’s probably best not to rely on just this method for your SEO endeavors. Before any other discussion, publishing duplicate content brings little or no value to readers, which is why it’s not only Matt Cutts who find it useless, but also the search engine and any publisher who is preoccupied of creating something better for the readers’ needs. Curating content starts from a huge challenge – writing rich information without oversimplifying the facts. Give your audience credit, while at the same time offering systematized information that’s really easy to access and actionable. There are different ways in which you can curate content. The best way is to elevate the content that currently exists on the web on that specific topic. You can find the best sources with the most documented examples and, before writing about them all in an organized manner, maybe running an analysis of your own would be a great idea. What’s most important in content curation is to try and transform the content you’re approaching as opposed to just imitating it. Making constant efforts to be memorable in your industry may have got you good quality links from a few trusted sources. However, while it’s not recommended to center your SEO efforts around the search engines but around being useful to the reader, there’s a catch. The more diverse the (preferably deep) links pointing to your content, the more the search engine will be inclined to believe you’re making efforts to keep a natural profile of your website. A huge volume of links means nothing compared to a robust link profile coming from authority sources and – when possible – a diverse profile. While it’s perfectly fine to have a majority of links coming just from one webpage type, it’s also recommended that it’s not the only source of your backlinks. Your strategy can focus on getting links from just one source, but exclusiveness is a sign of an unnatural profile. The example below shows a well implemented natural strategy. However, diversifying your link profile shows adaptability, especially if it follows a specific strategy and isn’t randomly done. It’s a fact that Youtube videos come up in search results on the first page very often. And the video mammoth isn’t going to lose any of its popularity and influence any time soon, which gets me to the following point – why not turn this fact into your little advantage? Video content gets a lot of popularity – and so can you. Ranking for keywords when it comes to it isn’t that much of a chore as it seems. Whenever uploading a new tutorial you can update the description of its content, which has a significant contribution to your ranking success. 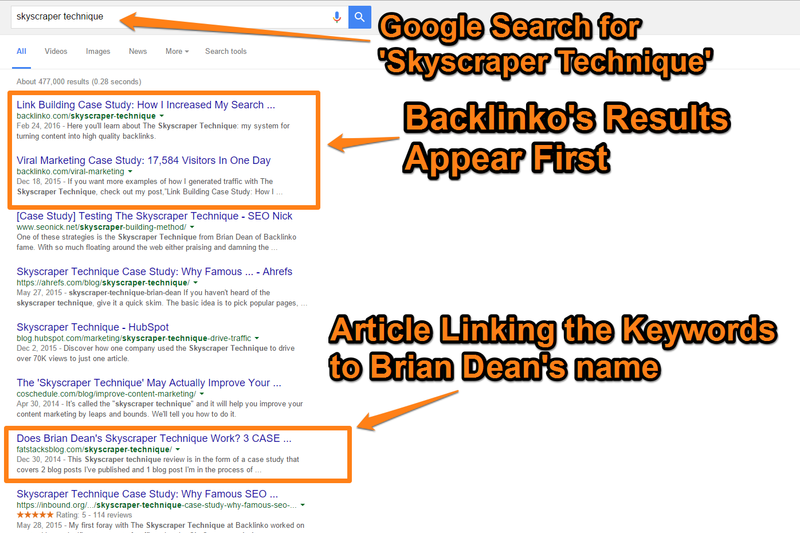 Shortly after the video was published, with under 6 k views, Brian Dean ranked 4th under the ‘link building’ Youtube search. You may think that 4th isn’t such a great performance, but given how mature the SEO niche is and how fierce the competition, this little SEO tip got him very far with small resources and investment. Aside from being popular on Youtube, assuming that the generic SEO efforts of people in this niche don’t necessarily focus on videos, a well described Youtube post can get you to appear on the first page of Google results. You can’t expect this to work instantly, it’s a process – but the investment-result ratio states this strategy is a gold mine. Let me clarify a misconception. People often correlate the ranking of a website with its content efforts, believing that what’s on the second page of Google results may as well be a top secret confession – because nobody gets to read it anyway. The skyscraper technique is about creating a piece of content that’s not only better than any other one on the topic, but than all of the articles indexed on the web put together. Chances are, treated correctly and updated constantly, this will be an evergreen goldmine. While in terms of ranking it’s true – the websites getting over 99% of the popularity are the ones on the first page, the second part of the statement is hugely mistaken. Being on the second page of Google results doesn’t say ‘I don’t care and I have crappy content and little to say to the world’; it says ‘I’m desperately trying to get to the first page and I’m doing all the effort that I can to achieve this, regardless of the very competitive industry’. You can exploit this situation from an SEO perspective – find the best content out there, make the arithmetic average of the opinions on a topic and create the most complete article there is. This technique, copyright Brian Dean, the owner of Backlinko, works every time if you don’t just skim through content and actually research it thoroughly. Quick concept. A lexical construction containing three or four words addressing a specific topic is what we call a long tail keyword. We call it so because of the traffic graphic. Contrary to popular belief, most of the traffic doesn’t come from the very generic keyword representing a brand or a topic – it comes from small parts composed of more specific keyword groups containing the brand or topic keyword. This means one thing, above all else – that your content efforts (as well as your link building ones) should be diverse and address more than just the generic audience. Generally, ‘breaking’ the traffic into smaller pieces of content for audiences interested in specific sub-topics will give us a better chance of ranking higher, due to the distinct interests of all the personas we’re targeting. When it comes to finding anything on the web, however specific, Wikipedia is the place to go to get a first impression on a topic. Let’s face it – it’s one of the most comprehensive content sources there are, and the result of a collaborative effort of keeping it objective and relevant. It almost sounds like there’s no better place to look for new keywords, doesn’t it? The reason why you may find it very useful is that being information-centric instead of keyword-centric allows the articles to be written in a very natural manner, thus providing you with fresh keywords with organic relevance on the topic that you’re researching. It’s the style that doesn’t seem to abide to the rules of content writing as we apply them today that makes Wikipedia a hot source to freshen your perspective on the words and concepts you should start using more in your articles. There is more than just one criterion to take into consideration before outlining your content marketing strategy. One of the points that we have always found crucial is deciding the amount of information that’s specific enough to be relevant and concise enough to be readable. the content depth – it seems like all we read is how everything has to be in-depth in order to have a legitimate audience. In fact, this isn’t always necessary – depending on the type of audience, the media that enhance the communication process etc. content can be to the subject and concise. However, in case you’ve decided to write something substantial with a sensitive acuity and only addressed to a specific niche, you shouldn’t be expeditious and superficial. While these are all valid criteria we should take into account before writing a piece of content, it’s also true that – especially on a blog – any article of under 1500 words will be considered as too thin for the search engines and specialized audiences, excepting the once-a-year, news-related articles that sometimes can be summarized well in 800 words. One of the lessons we all learned when entering the content marketing industry was that internal links can also be a great asset for our site. And although this is true, it’s also essential to understand the process through which we can transform them into an instrument that helps building a hierarchy into our website architecture. Additionally, you will have to keep an eye on the performance of every page of your website, in case strategy changes are required. For instance, if one page performs better than you expected, you may want to take into consideration boosting it through meaningful deep internal links, as well, to give it a push in the ranks. Anchor texts are one main character in this story, and the way we use them sometimes decides whether we’ve helped our on-page SEO or not. Let us be redundant yet again – it’s in Google’s best interest to deliver relevant results. Tricking the search engines is something that not only seems to rarely work, but is short timed as well. This is why we’re going to suggest the no-tricks policy – use the anchor texts naturally to keep them relevant – just like you would if there were no Big Brother to establish your rankings. The second main character in this complex internal linking story are the deep links. Usually, the more contextually you’re linking, the more relevant that internal link is. And it’s not only good for the search engine, but for the readers as well. Keeping the links natural gives the readers a positive, meaningful experience. Correlate the content to other relevant articles on the topic or – when necessary – on a closely complementary topic that completes a perspective. Without doubt, there are endless types of content that doesn’t date. Since investing in creating relevant, information-rich articles that satisfy the readers’ needs is something that always takes a lot of time and research, it’s unfair to see how after you’ve published it you’ll only get traffic from that specific blog post for a few hours. Content doesn’t have to be generic and superficial to be evergreen. And if so it happens that you create a piece of content that is, let assume, a retrospective for 2015, update it the following year and maintain your content’s relevance, while also generating information-rich articles. The secret of evergreen content is being constantly preoccupied to find something that will maintain its relevance for your audience in time. Once you did this, taking time to do serious documentation is crucial since otherwise the entire idea of creating something that stays actual loses its purpose. Let’s see what happens when you’re dealing with a mature niche. Instead of being easy to rank for the most popular keywords in your industry, it’s actually a work of Sisyphus even trying to get to the (not first, not second) third page of Google results. How come we’re so bold as to say this? It’s easy – you can replicate this theory of ours yourself. Find a mature industry that’s highly competitive and the acuity of content marketing has to be spotless to make it work. Then search for a keyword in that industry. Then go to the 3rd page of Google results and open a link randomly. I know. Shocker. It’s not only very relevant to the subject, but it’s seriously documented and very well written as well. And why does this happen? Because people are dying to rank for very popular keywords. While this endeavor is something we very much agree with as a long term strategy, it’s always smart to rank for your own keywords. The example of Brian Dean is perhaps the most illustrative for this point. He invented the skyscraper technique as a means to create the best article based on what was already on the web on a certain topic, after thorough documentation. It’s distinct from content curation by the fact that it doesn’t aggregate the existing content but it uses it as a premise to create the most in-depth piece of content that brings more relevance than reading the first pages of Google results after a search query. As you can see in the screenshot above, he ranks best for the keyword he created and his name is associated with the technique, all in the first page of Google results. The web era is the context where influencers have a lot to say – and they always seem to trigger a high response rate. Gathering them in the same place can have extraordinary results. Think of it this way – you’re organizing an event, a concert for instance. If the headline is a great band, your chances of gathering more people at your event increase. However, if you make it a festival and you get together 7 bands as popular as the headline, you’ll have a lot more participants to your event. Of course, they won’t be exactly 7 times more than the initial number of participants – because they have some common interests, which means that you can only add to the number of readers the ones that represent a specific difference between one expert and another. However, even in these conditions, the results can be spectacular. The following example makes no exception. The article gathered over 40 experts to give their opinions on content marketing and it easily made over 8 k shares. It’s a win for the writer of the post, who triggered a large number of pageviews, while also getting to be a little more popular after contacting the experts through email outreach. And it’s also a win for the reader, whose interest is respected in this post – giving specific, concise and valuable information on how to grow your blog. Running a link audit is, in many aspects, like looking directly into the soul of your competitors’ marketing strategy. Interpreted correctly, this can help you figure out the generic idea behind their publishing efforts. Knowing if your competitor is mostly linked by blogs, forums or news sites is vital in understanding who they’re aiming at when publishing a new piece of content, and so is knowing the webpage category in figuring out what kind of industries are most interested in their articles. If my competitor is successful and manages to engage a community as to constantly come back on the site and read their content, you can read their articles and then see what type of information or structure style is preferred by people who own a blog in the tech industry, for instance. Then you’ll know what to do to reach that exact audience and have a real chance to succeed. Popularity is 99% sweat. High quality content alone doesn’t do miracles. However, exceptional planning skills do – and being Sherlock from time to time doesn’t kill either. Online visibility is much more than the number of shares your articles have – it’s everything from planning on addressing a certain audience to understanding their needs and their reaction to topics similar to yours. The difference between a prospect landing on your page and then leaving immediately and one who will engage on your website and spend time there often lies in the way your landing page is optimized. One of our favorite examples is Monotype. To make their activity clear – and interactive, their fully text based landing page offers the possibility to both change the font of their copy and edit the text into anything. There are many things to be said about landing pages. One of the first, by far, regards their number on your site. Although many small businesses fail to see how that’s relevant, landing pages are crucial in a functional marketing strategy that converts. It’s not a secret that Dell has well over 1000 landing pages that perform 300% better if tested against website pages, or that Genworth increased lead volume by 3000% and their digital-driven revenue by 350% by changing their landing page approach. Another interesting stat that you may want to take into consideration is this one: Websites increasing the number of landing pages from 1-5 to 6-10 didn’t experience any major change. However, the ones increasing their number from 6-10 to 11-15 had 55% increase. The same keyword or topic performs distinctly on web and mobile. The fact that mobile searches are dramatically growing in popularity because – let’s face it – desktops are less dynamic than smartphones, hence the growing preference for the latter category. While in theory this only means that we’ve got adaptive mechanisms that help us cope with the flooding amount of information we come across every day, for SEO professionals it also means something else. Mobile optimization is a key factor in ranking mobile, especially since 72% of the smartphone owners believe it’s more likely to visit a website again if it’s mobile friendly. User experience has become more and more important since it’s one of the decisive factors in your traffic numbers. 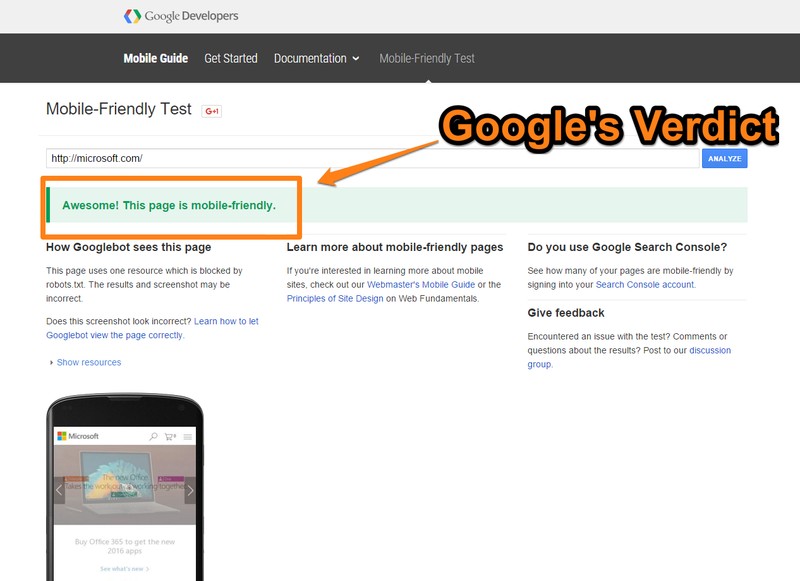 And because to the search engines it is equally important to provide a satisfactory experience as it is for the users to have one, the screenshot above was taken on Google Developers’ Mobile Friendly Test, especially since it’s one of the ranking factors of Google’s algorithm. Being concise is what often attracts an audience more than anything else. This is why infographics, while also visually pleasant, attract people through their conciseness, providing the website with a much larger engagement rate than usual content. According to an infographic published by Neomam, 99% of sensory information is filtered out by our brains due to the overstrain, meaning that only 1% of what we’re presented is actually given a proper chance, while 90% of the information we come in contact with is processed through visual stimuli. And if what you’re thinking right now is that maybe you don’t want to hire a full-time designer to do this job, you don’t have to be an expert in Illustrator to find free websites that allow you to create your own infographics. One of these inspiring sources is Canva, which provides great default layouts for infographics. Another great place to go to when you need to personalize an infographic layout in order to make it suit your site’s design is Easel. This doesn’t mean that all your information should be delivered through the form of infographics, but that this tip should be taken into consideration given the increased memorability of visually-delivered information. Getting out of the box with your content can often prove to be highly useful when it comes to rankings. Consolidating your brand’s presence and the keywords you wish to be ranking for can be done through the means of other platforms than the ones you own and the generic social media posts. LinkedIn is a high-quality publishing platform that grew to be the most reliable source for professionals. Depending on how much your industry is related to the presence online, it can be highly beneficial to duplicate the Twitter contacts (for instance) by LinkedIn connections. After you’ve done this, publishing an article a month can increase your brand reputation, since the platform is solely dedicated to professionals and, therefore, you no longer have to compete with posts from thousands of other entities. the very authoritative source that will host your content, thus constituting a perfect means of promotion. Similar to the Slideshare strategy, you can start promoting your content on other authoritative platforms populated by knowledgeable people, such as Quora. Aside from the ranking advantages, you can also increase and diversify your audience. It represents a powerful hook for your readers, on the condition that the content you suggest for further reading is closely related to the ones they spent time on. Thinking of thick industries where there is a lot of content to be read, such as travel or fashion, it can confuse the search engine, particularly when there are very few or none external links. This is where internal linking also pays a crucial role, creating a semantic connection between different topics, in order to help avoiding any possible confusions of the search engine. Often, it’s almost not worth it spending so much time documenting a piece of content thoroughly just to see it get lost in the content avalanche online. The first content writers who decided to update their previously documented content instead of working on another piece from scratch were clearly under the same impression as we are today. And it’s not only beneficial in terms of traffic – although this is the main advantage around this SEO tip – but in terms of link building as well. You’ve already worked to make a piece of content specific enough to be niche-relevant and get quality backlinks. Start from here. Take the example of Sugarrae. Updating old content to match Google’s changes in algorithm is a smart move for everyone in the SEO business, especially since it can significant traffic using a smaller effort than it takes to write an article from scratch. The great advantage is that, having written on the topic, you know how interested people are in reading about it – which gives you leverage on updating the content that brought the most traffic when it was first published. Of course, it goes without saying that the content will also have to be relevant and up to date, while also keeping the user’s interests in mind. Short clarification: the reason why the search engines can’t afford to make their algorithm public is that, whenever pieces of it become widely known, people try to cheat the system, abusing the specific criteria. This is very relevant contextualization when it comes to guest posting – a few years ago this technique was a mess. Not because people didn’t know how to do it, but because they overdid it. There were guest posts everywhere, very few of which related to the area of expertise of the guest blogger.The technique was abused because it was used as a cheap source of links. However, this technique has proved that it can still be highly useful when done properly. After the abusive-period there began the penalty-period because of flooding link profiles. However, writing relevant content on a specific topic in your niche can have tremendous effects on your brand recognition in the context of professional, responsible guest posting. Being exposed to strikingly reputable websites creates a trust and reputation transfer in a reader’s mind from the source where you published your content to your brand. Take this article we published on Search Engine Journal, for instance. It had 700 shares and over 10k reads, which makes it quite popular. Of course, we focused on satisfying an informational need of the audience. This content-focused attitude is what builds credibility and reliability as a professional source online. It’s vital to distinguish between the services you’re promoting and the audiences you’re trying to get to. Consequently, the article being written as a thoroughly documented piece brought us extra traffic. Generally, a well written guest post will be a refreshing method to generate leads, provided that you take into consideration the type of platform you’re posting it on as well as the general audience of said website. An important part of the SEO process, although few seem to talk about it, is the on-page strategy. The reason why it’s so scarcely approached is not due to its lack of importance, but to the fact that it’s a lot easier to implement than the off-page strategies, partly because it doesn’t involve any external factors. These being said, use proper titles and descriptions. The more easily read these are, the more relevant they become for the crawlers as well. It’s essential that the naming process takes into consideration the topic and structure of the content, as well as the direction of the topic. The URL structure has to be clear and to use a permanent link in order to be both memorable by readers and accessible to crawlers. Descriptions are what’s displayed in the search results – a short 150-words summary on the content. Advertising the page properly dramatically increases the chances of accessing the page and reading as much from it. Because formatting is sometimes what sells the content, it’s also crucial to make it structurally clear – everything from quotes, underlines, bolds and italics can contribute to readers spending more time on your website – not to mention proper titles and subtitles with H1, H2, H3 etc. attributes. Images are another important factor and they can be optimized as well. Starting with reducing their dimensions to make the loading smoother to using ALT tags to describe their content as to be relevant for the crawler, there’s nothing to be left out. For instance, the image file name matters almost as much as the image itself – giving it a descriptive name that helps the bots understand what it contains increases its chances of organically appearing on Google results on the image section. You guessed right. The answer is ‘great emailing technique’. He earned the cookies by convincing Noah that he can be a) relevant, b) personal (see PPPS) and c) creative, while also to the point (see subject line). The most reliable outreach email doesn’t lack anything from sugar and spice to everything nice. As we’ve documented in another article, the response rate for a cold email outreach is generally very low, because people often forget to treat it like a contextual content – one that has to persuade, to impress and to invite to action. However, the approach in the screenshot above managed to stand out because of its natural, yet pertinent tone. The reason why usually outreach emails have such a low response rate is the very natural law of offer-demand ratio. Since there are plenty of people emailing influencers, it’s only logical that they’ll answer to the most appropriate and to-the-point requests. A significant part of traffic comes from organic searches – this is why we’re so considerate about our search engine marketing. For instance, getting to have 77 comments on one blog post is quite a performance, supported by the fact that expert opinions were shared and featured in the article. However, it would be naïve and counterproductive to neglect the importance of other factors in this very complex success formula, one of which is influencer marketing. Micro-celebrities or, as they’re called from a marketing point of view, influencer marketers are very popular people in their micro-niche, who represent a standard of quality and professionalism. Targeting them to spread your content on social media doesn’t only bring new traffic, but also generates an implicit associative mechanism through which part of their image capital is transferred to you. Truth is, starting from the premise that no business can survive online without serious storytelling implication, influencer marketing can be of great help in amplifying your stories. There’s nothing easy in making an influencer want to share the wisdom you spread across social media platforms – and it’s partly because the moment they share or retweet something of yours, you automatically have a huge increase in credibility AND they are aware of this. However, the key in impressing the influencers so much as to share your stories is to be personal and make them relate to your experiences – show a human side you think they’d like to be associated with. Reverse Image Search is a neat link building technique, especially because the cost-benefit ratio makes it more than worth your while. Now let’s suppose you wish to see whether an image of yours is being used somewhere else on the web without it being linked to your site. Let’s take this image from one of our blog posts. It belongs to cognitiveSEO. After clicking on Copy Image Address, go to Google search and paste the address in there, then press search. You’ll be suggested to try searching by image. Click on it. The returned results display two important categories: a) the photos on the web that are found to be similar to yours and b) the URLs of the websites where this image is featured in the posts. All you have to do now is click on each of these URLs (which didn’t stop to the first page, in our case) and see which of these don’t link to your site. Contact the admins/authors and you’re on the way of getting the well deserved credits. It’s almost physically painful to try and stay connected to everyone mentioning you on the web – it requires constant monitoring and a humongous amount of time. However, there are tools where you can monitor your brand to see instantly who’s talking about you on the web at the moment. We used BrandMentions to run the analysis, a tool we created especially for real time monitoring. Type in your brand name and see what’s been happening on the web while you were busy writing great content – get instant feedback of how you perform and what people in the industry think of you meeting their competitive requirements. There were 34 mentions of our brand during the last month – many of which didn’t link to our site. Contacting the authors of the posts personally doesn’t only create a huge networking opportunity, but it also constitutes a great link building opportunity – especially because everybody appreciates a prompt professional. Comment marketing is the technique by which you provide insightful comments to niche articles, without directly promoting your business, for the solely purpose to help users. For this to work you first have to get it out of your head that comment marketing is the same as randomly commenting on blog posts. It goes without saying that the strategy you should apply further depends directly on the type of objective that you’d like to accomplish through this technique. However, in order to help your reputation management strategy succeed, you will have to be specific in your approach and always address the right audience on the appropriate platform. Let’s assume your goal is more traffic – leads that will be interested in visiting your website just after reading your comment. For this to happen, make sure that they’re no more than one click away from your website. Instead of agreeing with a general opinion or posting an emoji, maybe you should write something significant – an opinion that will stand out and raise eyebrows, something that will make people curious to see what you’re about. It has a lot of traffic from competitive actors in the industry. Regardless of your purpose, you should be consistent and relevant in your endeavor, otherwise you’ll be that-annoying-guy-who-doesn’t-understand-the-industry-but-has-an-opinion-nonetheless. And that’s not an option in comment marketing. If your goal is exposure – becoming notorious, you’ll have to channel your efforts towards finding the pieces of content that influencers go to and start from there. Unlike the one about your traffic, the exposure objective refers to anybody who can be thought of as a prospect for your business, not just people already gravitating around it. Take the Search Engine Journal for instance. It is a good complementary idea if you’re trying to strengthen your authority as a professional source in the field, because of all the daily visits, the authority, etc. Writing a good comment there can be the reason for a hundred people associating your name with an authoritative opinion – and that’s the secret of being memorable. This technique requires, first of all, a complete lack of abuse coming from an objective evaluation of your product’s most important features and releases. It contributes a great deal not only to your link profile in itself, but to your website’s ranks as well. Of course, the immediate disadvantage is that such authoritative sources choose their employees to be skeptical and it’s a quality in their actual job description, which may make it a little harder to persuade them that your professional improvements constitute a valid press subject for them, which is exactly why this tip shouldn’t be abused. It’s infinitely easier for the overall strategy of your site to succeed in terms of SERPs positions if you focus the efforts of internal linking towards lifting one page per keyword. Let’s assume you’ve got the keyword ‘link building’ that you want to rank for. First of all, the quality of your content may have to suffer, keyword targeting aside, if you focus on the same topic all over again and your entire website may become redundant instead of useful, in time. Assuming you always write for the readers’ best interest, it’s still true that the search engine will find it difficult to prioritize between distinct pieces of content on the same keywords that you’re linking to so – best case scenario – this will lead to cannibalization. Having established that it’s detrimental to try to link for a keyword on more pages, this also constitutes the premise for great quality, well documented content on each of your pages – given that you’ll focus on different micro-topics instead of the generic theme. Facebook posts that have images perform 2,3 times better than the ones without images, as shown by this Buzzsumo article. Don’t be afraid to be bold when it comes to video integration – it can take you a long way. When this wireless-bungee-jumping fake experiment first appeared, only featuring it in a post could guarantee for a thousand reads. Visuals engage! However, given that visual aids have to be the sidekick of great content, we always suggest high quality articles before establishing to what extent you’re going to be using this tip! It’s not wrong unless you’re doing it wrong. Generally, linking to a high authority, even with the ‘rel=nofollow’ tag, tells the search engine’s crawler that you’re mostly interested in providing quality information from reliable sources, thus keeping the readers’ interest on top of your blogging business. In this concern, it’s highly relevant to think of the domain ownership as one of the main factors in establishing its authority (assuming you’re not using any tool to provide you with information on this matter) – a webpage .org, for instance, will give away from the TLD that it’s covering a social interest rather than just a commercial one. It’s not uncommon for SEO practitioners to believe that the most important source of ranking success lies in being linked to by highly performing websites with good authority. However, while this is a place to start from, the search engine marketing strategy should always dig deeper and take all the micro SEO techniques into considerations. After all, it’s the extra mile that makes all the difference. Ultimately, the entire ranking process along with the information neutrality principle have the same purpose – to serve the user as well as it’s humanly (or spiderly?) possible. With this in mind, the content strategy concerning the informational structure of the articles you publish on your blog has to start from the premise that a dissatisfied reader will immediately leave your website and never come back. Of course, there are almost as many reasons as there are readers out there, but they can all be broken into smaller categories. One of these – and highly important – is how easily the user can find the content he clicked in for. There are more indicators that contribute to this quite generic type of satisfaction – such as having a sitemap that makes navigating through content intuitive, site-wide speaking. Article-wide, it’s crucial to organize the material as to satisfy the informational need as rapidly as possible and a table of contents is the type of guidance that a user needs in order not to get bored inside a large post. You’ll say that once the informational need has been satisfied, the user will leave the page, thus reading just 1 subheading of, say, 24, like in the example below. And while you’re right, the alternative wouldn’t be a user who reads the content entirely just to find what interests him, but someone who leaves the blog and never returns because of a negative experience. In the economy of decision-making processes regarding the user experience you provide on your blog, structuring the information in a friendly way improves the bounce rate dramatically on the long run, as it also increases the reader loyalty. The user’s attention span is 8.25 seconds and falling. This means that informational points have to be delivered quickly and in the most appealing manner in order to improve reader loyalty (and traffic, for that matter). Heat maps are a great instrument when it comes to deciding what button to place where, as they offer you information about the consumer behavior. Attention heatmaps – showing you where it is that people stop skimming through content and actually read it wholly; connecting eye movement with mouse movement and establishing the perfect place for a Call to Action. Although it’s best to use each of these instruments to conduct separate research and aggregate the data, if you’re in a hurry concerning your CTA positioning, the most relevant one is the attention heatmap, giving you direct insight on the best place to position a call to action that converts. Being a little creative and showing a sense of humor or maybe a little self deprecation whenever something goes wrong can take you very far. Of course, it all depends on the kind of audience you’ve got, on the relationship that you’re establishing with them. Is it personal? Is it highly professional? What commonalities is it based on? Depending on the answers to these questions, you can do what Worrydream does. Be artistic, funny and breezy about it. Maybe reference Magritte. Or, however, be a little jovial about it, like Lego does. Or be smart about it, like Magnt – use a Venn diagram. In the end, keep in mind that whichever strategy you choose, it’s only meant to make a difference – to be witty and raise eyebrows. Rankings won’t improve naturally unless you monitor them constantly. However, it’s almost impossible to do this without a tool to guide you through the process. Among the many dangers that come with the SEO business is the one of facing a negative SEO attack. As the very definition of it is something a competitor or somebody with bad intentions does, it’s even more difficult to prevent it. However, fortunately we’ve got this tool to perform Unnatural Link Detections and the possibility of filling in a Google Disavow file to send to the search engine specialists and request not to take those specific domains in consideration. And, of course, because maybe there’s some personal touch we’d like to add to this analysis, it’s always best to know you can rely on a self-learning algorithm that takes into consideration any manual change that you may be making as to improve the accuracy of the overall results. Recently, there’s been a discussion about the shareability of an article not necessarily meaning it was read thoroughly (or at all!). While this may be true, it’s also safe to say that whatever makes the first people share gets the ball rolling, transforming a piece of content into a sometimes endless or at least very long lasting slippery slope. People who see that others have shared a piece of content will be more keen to believe that that certain article is more sharing-material than an article that has no sharing buttons displayed. While it’s uncertain if this kind of attitude is nothing else but a mellow form of peer pressure, it seems to be working. This – last, but not least – technique is not used by many people in the industry, and maybe this is exactly why it works wonders. As we’ve already documented a detailed article explaining the procedure and implementation of this tip in the form of a case study of Über, we’ll only go through the basics. And while you’ll be tempted to believe that this specifically lingual difference in spelling shouldn’t affect the returned results of a search query, you couldn’t be more wrong. The truth is, for the keyword ‘Québec’ there are around 15 million results without diacritics and not more than 300 thousand with diacritics. What this means in terms of rankings and why it should very much interest you is better, easily improved rankings. Targeting the diacritics version of your brand – especially when it has the bad luck of being composed of quite common words – can improve the SERPs results dramatically. While there are hundreds of criteria based on which the search engines’ ranking algorithms are made, doing a little of everything while always keeping your reader’s best interest in mind is the best key to success. However, we’re not at all implying that this list of SEO techniques is all you can do to increase your website’s performance. So what is it that makes you so creative and you’d like to share? Great resource and thanks for the mention! Thanks for the great resource! Some people have already stopped doing some of these [ I’m guilty of it.. 🙂 ] since it’s really time consuming. But if you do invest time on this together with the other strategies, your campaigns will be successful. I found very good tricks to increase my blog’s traffic and new ideas to apply. Almost too much information to absorb but so much food for thought. Wikipedia is a goldmine and something vastly overlooked. Useful that they have a broken links section. I’ll look at this on desktop when I get a chance as it should serve me well over the next 6 months. Brilliant. I got many SEO tactics at one place, Thanks for your very nice illuminating information. This is an excellent article. As a user of SEO services, I think it is great to find an explanation of the goals and techniques of SEO written in a way that makes a complex topic available to non-experts. Well done! Its really a great resource for every webmaster who want to gain traffic for there website. Its very informative for me & a huge thanks for this valuable content! Great post Razvan. I alredy have a few ticked off that I plan to implement! Thanks again for a very comprehensive post! Is this list in order of priority tasks? Or did you list them in order by how easy to implement they are? It is such a long list as I propose what needs to be done to clients – that some seem ready to give up. A lot of important tactics and tips found at one place in this post. I optimise YouTube channel for some of my clients by using right keywords in the description section and yes it has really improved the traffic to the channel. Also infographic outreach works great and is one of the best link building techniques if done in the right way with engaging and informative infographic creation. Visuals are shared very fast if they are informative. Amazing article. Took me some days to read it all, but totally worth it. Time to implement some new stuff. Great long and informative article!Sometimes, I felt that I wanted to stop reading but this post is worth reading. I’ve learned a lot of SEO techniques here so I want to thank you for that. You actually need some time to implement all the guidelines. The techniques you presented are perfect, they should be in every webmaster guide. Great work. Greetings from Poland! Really a great source! I implemented some of the SEO techniques mentioned above and they were beneficial in doubling the traffic. Well-written! Google webmaster tools is a must have. What an amazing list of techniques for any SEO person to explore! Thanks Razvan for this valuable and informative resource :). I will definitely give Wikipedia link building a try! A beautiful study with graphic examples. I am impressed by the large contribution of work.